and 90% don't even know they have it. for children 8-17 years old. The Cooper Center for Metabolism (CCM) is a clinical facility dedicated to the diagnosis and treatment of underlying metabolic causes of type 2 diabetes, obesity, and infertility. Did you know that your brain and body communicate through hormone messengers to control your metabolism, body weight, and appetite? The study of metabolism, appetite, and weight regulation is one of the most exciting areas of medicine today, and the scientific discoveries of the past two decades bring increasing clarity and promise to the treatment of patients with obesity. Elevated cholesterol, blood pressure, or blood sugar, high body weight, and infertility frequently share an underlying metabolic cause. In fact, obesity is now categorized by the American Heart Association and the American Medical Association as a “multi-metabolic and hormonal disease state” because scientists have found multiple imbalances in key metabolic factors, hormones, and neurotransmitters in those who are affected. Dr. Emily Cooper is the Founder and Medical Director of CCM, and is Board Certified in Family Medicine, Sports Medicine, and Obesity Medicine. She and her team are committed to providing the highest level of individualized patient care possible. Through science-based medical diagnosis and treatment, patients experience regression of harmful disease processes while developing and maintaining as healthy a metabolic system as possible. For more information about our facility, maps, and driving directions, please see our Office Location and Directions page. 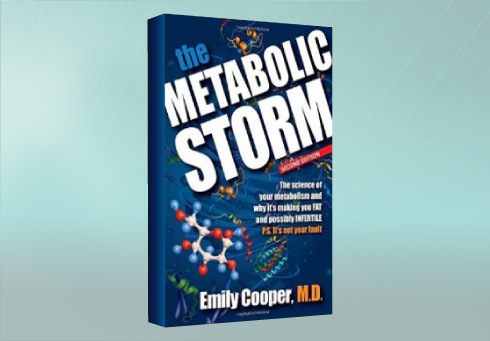 In the second edition of The Metabolic Storm, Dr. Cooper presents science that obliterates myths about diets and obesity. She explains that the metabolic system is extremely complex and profoundly affects other body systems such as reproduction and fertility. The Metabolic Storm explains why weight issues are not the result of laziness, lack of commitment, or absence of willpower. It introduces the breakthroughs and answers discovered, but never properly disseminated, through more than 100 years of scientific research. Once you understand the metabolic system, you will never want to diet again. All proceeds from book sales are donated to the Diabesity Institute, a nonprofit founded by Dr. Cooper and dedicated to increasing access to effective medical care for those suffering from diabesity by advancing the science of metabolism.